Galleanists (Italian: Galleanisti), followers of anarchist Luigi Galleani, were primary suspects in a campaign of bombings between 1914 and 1920 in the United States. The Galleanists were a group of Italian anarchists and radicals in the United States who followed Luigi Galleani and his message of heroic violence in the face of capitalist oppression. Galleani was a figurehead in the Italian anarchist movement who, following the violence of the 1913 Paterson silk strike, turned from promoting a general strike to promoting individual acts of violence against capitalist targets. He believed that the spectacle of terrorism would trigger popular revolt. For the part of his followers, Galleani prompted a symbolic war that continued after his deportation and the raid on his newspaper. The police used La Salute è in voi, Galleani's Italian-language bomb-making handbook, to profile anarchist attackers. Historians later used the handbook as proof of Galleanist responsibility for crimes and detectives referenced it as evidence of Galleanist conspiracy. Its invocation represented a power through threat of violence. Galleanists were primary suspects in a campaign of bombings between 1914 and 1920. Instances included mail bombs to business and government officials and the 1920 Wall Street bombing, which killed 38 people. In effect, however, none of the Galleanists' bombs hit their targets: capitalists, police, or judges. Their casualties were themselves and bystanders. Their bombing methods borrowed from the Italian Black Hand extortion rackets, in which the attacker would write a threat of future violence and place bombs in doorways. These extortionists adapted fireworks, a popular Italian industry, with shrapnel or stole dynamite from construction jobs. Anarchists, however, lacked the community experience with high explosives and thus overestimated their ability to create working bombs and underestimated their risk. New York City Galleanists formed the Bresci Circle in honor of Gaetano Bresci, the anarchist assassin of Umberto I of Italy. By 1914, almost 600 members met regularly at a rundown house in East Harlem. A plot to bomb the Rockefellers increased police interest in the group. Several months after the 1914 Ludlow Massacre, the type of capitalist violence that incensed Galleanists, a group of anarchists carried a bomb to the Tarrytown estate of the Ludlow coal mine owner, John D. Rockefeller, in July 1914. They miscalculated, both in failing to trigger the device and since Rockefeller was out of town. 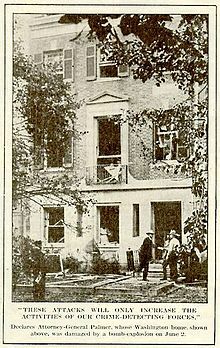 A member of the Circle was arrested and the bomb, which they carried to an East Harlem tenement near the Circle's headquarters, exploded, demolishing half of the building and killing three anarchists. While no group took responsibility for four additional bombings in 1914, the police continued to suspect the Bresci Circle. In October 1914, bombs exploded at St. Patrick's Cathedral and the priest's house at St. Alphonsus Church. There were also attacks on the Bronx County Courthouse and The Tombs, a jail. The newly inaugurated New York City bomb squad sent undercover detectives to infiltrate the group. The plant coordinated a trap for an attempted bombing at St. Patrick's in March 1915 that involved fifty disguised officers and caught Frank Abarno and Carmine Carbone. The anarchists and police differ in their accounts of initial meetings, including Abarno and Carbone accusing the police of entrapment, since the undercover agent supplied the bomb materials and laboratory. Their trial revolved around La Salute è in voi and the defendants' right to read any books of any kind, including bomb-making handbooks. They ultimately received sentences for six to twelve years. The case rekindled fear of easily accessible bomb-making instructions and sensationalism around anarchism. In 1919, four Italian anarchists died in Franklin, Massachusetts, when attempting to bomb the American Woolen Company during a strike. Also the Galleanist Carlo Valdinoci died while setting his doorstep bomb, intended for Attorney General A. Mitchell Palmer Postal workers and police also found bombs before they detonated or failed, including many of the 36 mail bombs in 1919. The 1920 Wall Street bombing in New York City killed 38 people with an advanced bomb detonated on a horse and wagon parked across from J.P. Morgan & Co. Historians believe Galleanist Mario Buda to be the bomber, as revenge for the indictment of Sacco and Vanzetti, his friends. Buda possibly had experience with dynamite from work in Michigan. The Wall Street explosion was timed for noon, a busy time of day. An extortionist leaflet found nearby demanded the release of political prisoners. ^ a b c Larabee 2015, p. 37. ^ a b c Larabee 2015, p. 44. ^ a b Larabee 2015, p. 46. ^ a b c Larabee 2015, p. 45. ^ Avrich 1996, p. 97. ^ a b c d Lardner, James; Reppetto, Thomas (2001). NYPD: A City and Its Police. Macmillan. p. 173. ISBN 978-0-8050-6737-8. ^ a b c d e Larabee 2015, p. 41. ^ Lardner & Reppetto 2001, pp. 173–174. ^ a b c Larabee 2015, p. 42. ^ a b Polenberg, Richard (1999). Fighting Faiths: The Abrams Case, the Supreme Court, and Free Speech. Cornell University Press. p. 58. ISBN 978-0-8014-8618-0. ^ Larabee 2015, pp. 43–44. Avrich, Paul (1996). Sacco and Vanzetti: The Anarchist Background. Princeton University Press. ISBN 978-0-691-02604-6. Larabee, Ann (2015). "Sabotage". The Wrong Hands: Popular Weapons Manuals and Their Historic Challenges to a Democratic Society. New York: Oxford University Press. pp. 36–63. ISBN 978-0-19-020117-3. OCLC 927145132. Gage, Beverly (2009). The Day Wall Street Exploded: A Story of America in Its First Age of Terror. New York: Oxford University Press. ISBN 978-0-19-514824-4. OCLC 779913767. McCormick, Charles H. (2005). Hopeless Cases: The Hunt for the Red Scare Terrorist Bombers. Lanham, Maryland: University Press of America. ISBN 978-0-7618-3132-7. OCLC 60358652. Neville, John F. (2004). Twentieth-Century Cause Cèlébre: Sacco, Vanzetti, and the Press, 1920–1927. Westport, Connecticut: Praeger. ISBN 978-0-275-97783-2. OCLC 54350494. Pernicone, Nunzio (2003). "War among the Italian Anarchists: The Galleanisti's Campaign against Carlo Tresca". In Cannistraro, Philip V.; Meyer, Gerald (eds.). The Lost World of Italian American Radicalism: Politics, Labor, and Culture. Westport, Connecticut: Praeger. pp. 77–98. ISBN 978-0-275-97891-4. OCLC 52335014. Wellbrook, Christopher (2009). "Seething with the Ideal: Galleanisti and Class Struggle in Late Nineteenth-Century and Early Twentieth-Century USA". WorkingUSA. 12 (3): 403–420. doi:10.1111/j.1743-4580.2009.00246.x. ISSN 1743-4580. This page was last edited on 15 March 2019, at 22:12 (UTC).